Gallery Vask in Manila is the only Philippine restaurant to make it on the Asia's 50 best restaurants list this 2016. It sits on number 39. Chef Chele Gonzalez has trained at Arzak and Mugaritz(San Sebastian), El Bulli and El Celler de Can Roca among others in his native Spain. 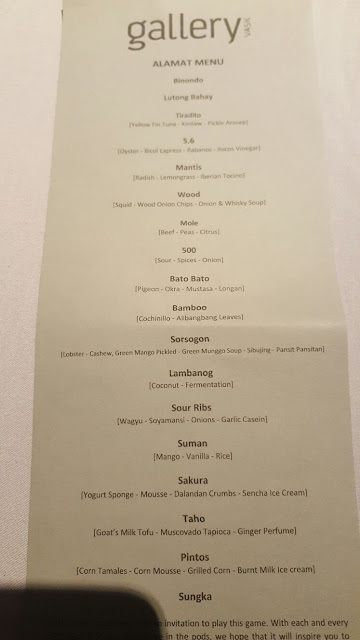 His tasting menu is a compendium of his journeys around the provinces of the Philippines, weaving together the country's history through the usage of local ingredients and his stories behind each dish. Chele works with local farmers and fishermen in order to use fresh, indigenous products while honouring the nature. This fusion cuisine takes you on a sensorial journey ... as the napkin advises: relax and open your mind ... and you will get a mind-blowing explosion of flavours. Upon our arrival we were offered a nice cocktail outside on the deck ... then the real adventure started with the 14 course tasting menu ... actually the first two were extras ... so 16 dishes all in all! So called "street food", green bananas filled with foie gras! And small empanadas. Sungka was the last dessert consisting of 10 different petits fours...I must have forgotten to take a picture. Anyway we took the petits fours home with us and had a nice sweet breakfast the following morning! 14 dishes sounds tremendous ... but with the wine pairing everything seemed to find its own corner in our stomachs. Furthermore almost every dish was outstanding in one way or the other. The fusion cuisine played a major part during the whole tasting procedure. The price per head was Php 4900, which is about 100 €. Actually surprisingly cheap by our European standards. We also chose the wine pairing which was an additional 60 € per person. The following wines were served with the tasting menu. All the chefs that worked the dishes to perfection before our eyes...and each in turn brought the small pieces of art to our table followed by thorough explanations of ingredients and how the dishes were made into these taste explosions...unfortunately the owner himself was absent. The restaurant seats only 20 guests and also functions as an art gallery. 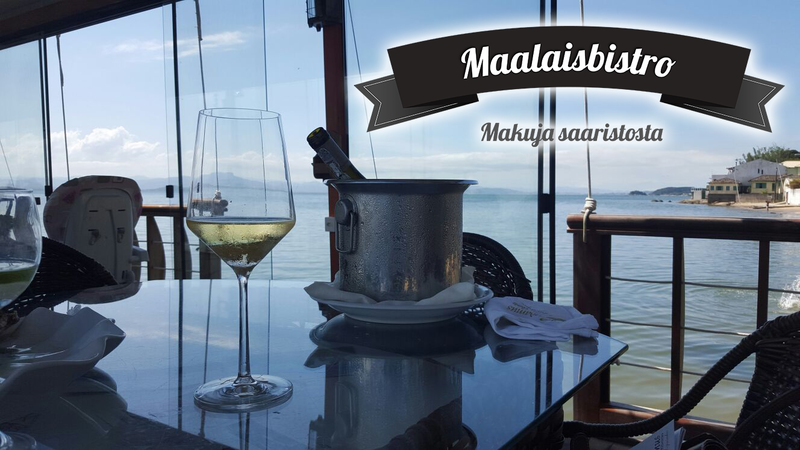 It has a sister restaurant on the other side of the wall called Vask tapas room, which is a less expensive alternative. Krisse...du skulle nog ha gillat det mesta. Intressanta smaker och ingredienser från naturen som man nog måste ha enormt säkra smaklökar fö att kunna kombinera på de mest fantastiska och oväntade sätt. Trevlig helg!